Gauge Guards & Instrumentation – Plast-O-Matic Valves, Inc. Gauge Guards barrier seal protects instruments from corrosion and clogging while maintaining high accuracy. Compact and ultra-pure zero dead leg designs available. Offered with or without gauges. Flow, Level, and Pressure Switches signal equipment, controls or alarms as system parameters change. 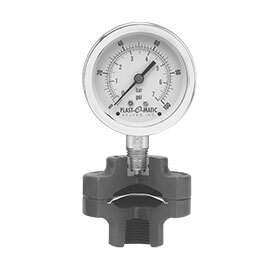 Differential Pressure Gauges, Indicators & Variable Area Flow Meters indicate system conditions and changes at a glance. Differential Pressure Flow Meters provide a high-visibility, easy-to-read alternative to rotameters, and can be mounted in virtually any position. Fluid Presence Sensors signal whenever unexpected or unwanted liquid is present, in tanks, piping systems, as well as primary seal failure in Fail-Dry valves. Series GGS & GGSE Superior accuracy pressure or vacuum isolator with steel-reinforced gauge hub and a wide range of options, including acrylic shield, removable housing, choice of gauges and materials. Series GGMU Ultra-pure “zero deadleg” inline isolator in PVDF, Natural Polypro, or PVC with a variety of spigot or sanitary connections and gauge options. All POM Gauge Guards are available without gauges for use with instruments, alternative gauges, etc. 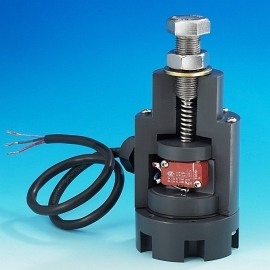 Series SWT Pressure Switch with PTFE diaphragm, for pressures to 150 PSI. Versatile snap-action 16 Amp/3 terminal switch is standard; low deadband 3 Amp switch optional. For 25 Amp switch, consult factory. PVC, CPVC, PP or PVDF. Series GGSLE Pressure Transducer with ranges from 30” vacuum to 200 PSI; 4-20 mA output signal. Includes Instrument Isolator w/ 1/2″ FNPT connection. BASIKS Series FS pre-set Flow Switch is available in PVC or CPVC, with flow rate range from .7 – 25 GPM. Switches offered from 5 VDC to 240 VAC. BASIKS Series FSA adjustable Flow Switch is available in PVC or CPVC, with flow rate range from 8 – 1900 GPM, designed for pipe size 1″ through 10″. Offers continuous adjustment during operation; SPDT 15 amp switching capacity model or Dry Computer/PLC Interface model. BASIKS Series LLS Liquid Level Switch with pivot pin design features SPST reed switch for 120/240 VAC 50 Watt power or optional DC dry circuit for computer/PLC interface. Noryl body. Series DPG Quantitative indication of pressure differential across a filter, points of use, etc. PVC or CPVC, 1/4″ FNPT connections with 0-15 PSID or 0-30 PSID Gauge, switch optional. Series DPI Indicator designed to show at a glance if maximum filter pressure has been exceeded. 1/8″ FNPT connections with 0-15 PSID or 0-30 PSID Gauge; PVC or CPVC. Series DPFM Highly visible flow meter uses differential pressure to measure flow rates with accuracy to ±2% full scale ascending, with repeatability at ±1%, 1/2″ or 2″ connections in PVC or CPVC. Series FIG Quantitative readout of variable area flow º” or Ω” FNPT Connections; PVC or CPVC. Series FPS Fluid Presence Sensor signal whenever unexpected or unwanted liquid is present; 1/8″ or 1/4″ connection. PVC, CPVC, PP or PVDF.